After our 60th birthday, we want to do everything we can to keep healthy, active and strong. Many of us are also wondering how to stay happy and positive as we get a little older. After all, with at least 20 years more ahead of us, the investments that we make now will make all the difference in the future. We all know that starting weight training or taking up a sport can make a significant difference in our physical health. But, what can we do if we want to improve our mental well-being and mindset? Quite a bit actually! There are plenty of small things that we can do every day to feel great. So, if you are wondering how to be happier and more positive after 60, here are six simple ideas. Several studies have shown that the amount of happiness that outside events bring to our lives is low. For example, people who win the lottery tend return to their original level of happiness after a few years. Good or bad luck just doesn’t seem to change our happiness for long. However, if you focus on activities that give you a sense of achievement, you can bring more satisfaction to your life. So, pick a skill that you have always wanted to improve and start working on it every day. Not only will your daily achievements make you happier, but, you may make some new friends who share your interests along the way. If you have a spiritual practice, it often helps to start the day by sharing your intentions and expressing your gratitude and hopes. Even if you are not a particularly religious person, you may be able to benefit from meditation. Practicing mindfulness can be a great way to prepare for the day ahead. In addition, according to this article by the Mayo Clinic, practicing meditation regularly can help you to manage stress, reduce negative emotions and increase self-awareness. Whether you’re still working, starting a “second act” career, or even retired, you’re probably super busy these days. In my experience, everyone can benefit from having a clear sense of what they need to accomplish. Making a list of items ahead of time gives you a sense of control and purpose to your day. This will help you feel more confident and empowered to handle whatever challenges come along. Organizing your life doesn’t have to be complicated. Simply taking 5 minutes every morning to write down the most important tasks that you want to accomplish can give you a huge productivity boost. If you are wondering how to stay happy and positive after 60, this is a great place to start! We learned as children that “breakfast is the most important meal of the day,” and this is still true after age 50. Eating a full breakfast helps you stay mentally focused, calm and alert throughout the day. If you don’t have time or don’t like to cook in the morning, buy some high-protein breakfast bars or other easily portable healthy snacks to give you the sustenance you need to start the day. 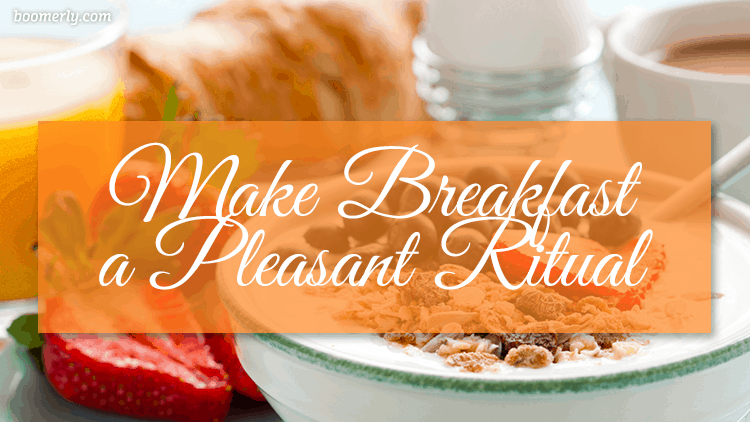 Even if you don’t have time for a cooked breakfast, try to make a morning meal part of your daily ritual. Give yourself some time to sit, reflect on the day ahead, and focus your energy. If you live with your spouse or partner, write them a little love note on the bathroom mirror and leave it for them to have a happy surprise to start the day. Take the time to write personal messages on Facebook. Instead of writing, “Happy Birthday,” tell your friend about a special memory that you have of them. Sometimes maintaining intimate friendships requires us to take a few emotional risks. Look for ways to make other people feel better by telling them how much they mean to you. Celebrate their successes and share in their triumphs. 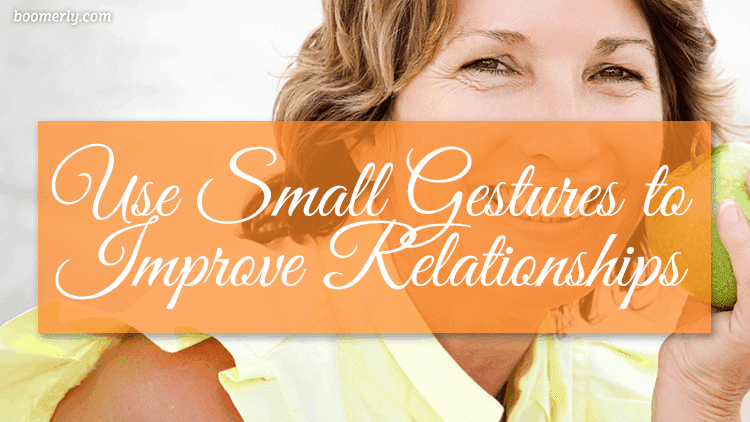 Give compliments throughout the day. Simply saying “That dress is a lovely color on you” or “You have the most beautiful eyes,” can make someone’s day. Many of us are reinventing our lives in our 50s and 60s. We are exploring our interests, starting new careers and rededicating our energy to projects that we enjoy. From this perspective, every day is a gift. Every day gives us the opportunity to be of service to others and to experience the wonders of life. What are you looking forward to doing and experiencing today? Try to find something to look forward to every day. Meet with a friend, go to a local museum, take a class or cook a new type of cuisine. Take a few minutes at the end of each day to look back and be grateful for all of the amazing opportunities in your life. After all, gratitude is one of the secrets to happiness at any age. Life after 60 is a time of new challenges and amazing opportunities. For many of us, our children have left the house and our social circumstances are changing. Now is the time to invest in our physical and mental health. We can feel energized and positive every single day. We just need to take action. What simple things do you do every day to stay happy and positive? What advice would you offer the other women in our community on the topic of how to stay happy and positive after 60? Please join the discussion. Here’s a short video that I recorded to help you boost your happiness level every day. Enjoy!